American Dryer built its reputation on the AD series dryer because, simply put, these dryers are built to last. 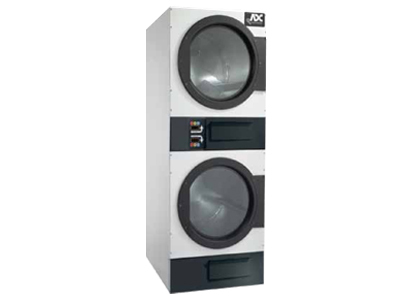 Our engineer driven approach and our passion for innovation, superior design and top-to-bottom quality makes the AD series dryer a popular choice for coin-operated laundries around the world. The AD-24 is a small footprint model with permanently lubricated bearings on the motor and drive system. It uses V-belts and pulleys for smooth, quiet, and trouble free operation. The cabinet is electrostatically powder-painted inside and out then baked at 420-degrees Fahrenheit before final assembly – ensuring the hardest surface and the longest lasting finish in the industry. The AD-24 also features a steel door with gasket-less glass and an easy-to-read LCD screen with a friendly multilingual interface. 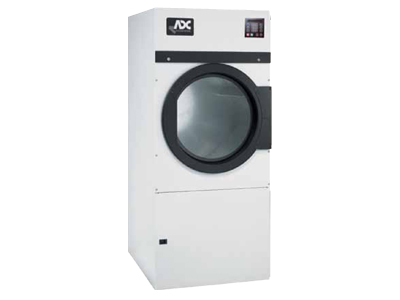 The AD-30V is a 30-lb capacity dryer built for high production, fast drying and rugged use. It is often matched with a 35-lb. washer. The V-belts and pulleys promise quiet and trouble free operation, while the rugged steel doors with gasketless door glass, electrostatically powder-painted cabinets and permanently lubricated bearings ensure a long-lasting product. The AD-30V is available in gas, electric and steam heat. 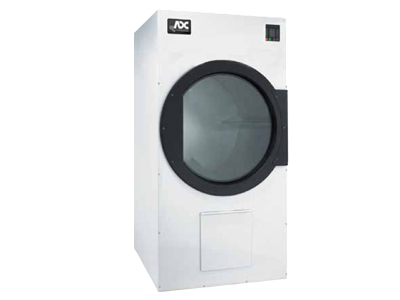 The AD-78 is the only full 75-lb capacity dryer that can easily fit through a standard 36″ door. 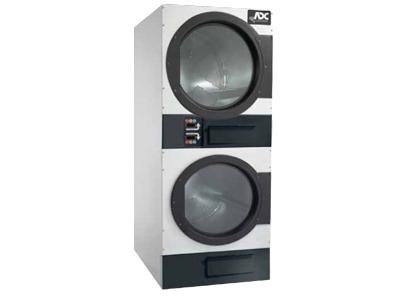 An ultra-shallow depth of 34″ and a wide basket for superior tumbling action make the AD-78 the perfect fit for high-volume coin-op laundry applications. The AD-78 is available in gas and electric heat. 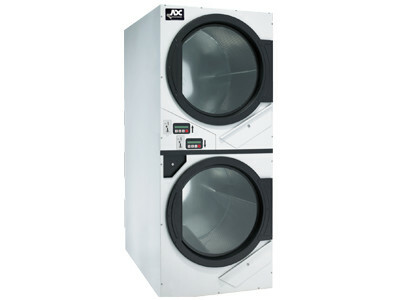 The AD-758V is a 75-lb capacity dryer equipped with an 8″ diameter vent connection plus 175,000 Btu/hr heat input and 1000 cfm airflow. This unit features a convenient full-length lint drawer. 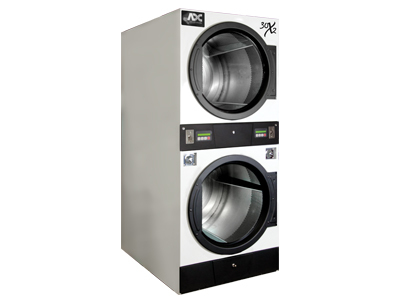 The AD-758V is commonly used in the replacement and new construction markets and is typically matched with a 55-lb capacity washer. The AD-758V is available in gas, electric and steam heat. The AD-115 bridges the gap between 75- and 120-lb dryers. This high performance unit incorporates all the state-of-the-art design features from ADC, featuring a heat input of 343,000 Btu/hr and airflow of 2,100 cfm. 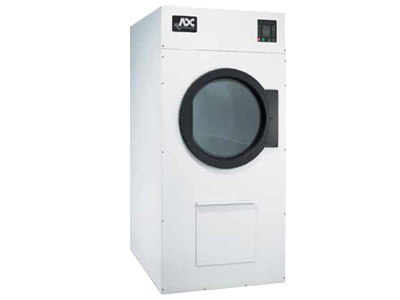 The AD-115 is the only 115-lb capacity dryer that can fit through a standard 48” door and is available in gas, electric and steam heat. 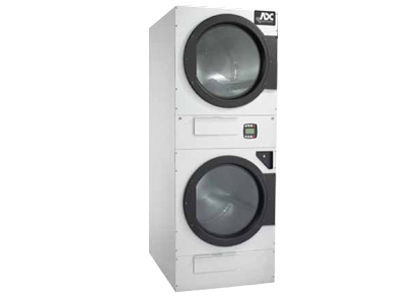 The AD-320 is a dual pocket 20-lb capacity dryer that includes axial airflow, independent electrical connections for each tumbler and separate exhaust connections. It offers 98% component accessibility from the front of the tumbler which allows the dryer to be placed against the wall without concern for regular rear maintenance. The AD-320 has a large lightweight lint drawer that is accessible and easy to clean and contains a stainless steel lint screen. The AD-236 is a dual pocket 30-lb capacity dryer which offers 98% component accessibility from the front of the tumbler- this allows the dryer to be placed against the wall without concern for regular rear maintenance. It features radial airflow with a single 8” diameter vent connection for both tumblers. This dryer includes electrical connections for each tumbler, a single gas line connection and independent microprocessors and coin drops for each tumbler. The AD-30x2R is a 30 lb. dual pocket dryer designed with efficient trans-axial airflow and rugged roller supported tumblers. This space saving dryer is only 31-1/2″ wide and just over 40″ deep with large capacity tumblers that can handle oversized loads. This machine has the option for single phase reversing and is fast drying and efficient, in addition to having exceptionally quiet and smooth operation. Another unique option for the AD-30x2R is to choose from different door trim colors to match your laundry’s branding. 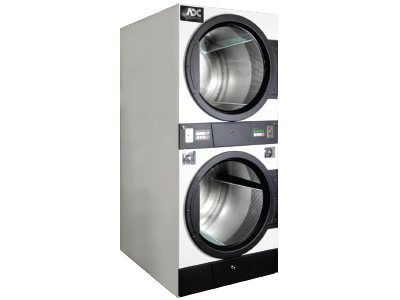 The AD-330 is a dual pocket 30-lb capacity dryer that includes axial airflow, independent electrical connections for each tumbler, separate exhaust connections and a single coin drop. It offers 98% component accessibility from the front of the tumbler. This feature allows the dryer to be placed against the wall without concern for regular rear maintenance. The AD-330 is available in gas, electric and steam heat. 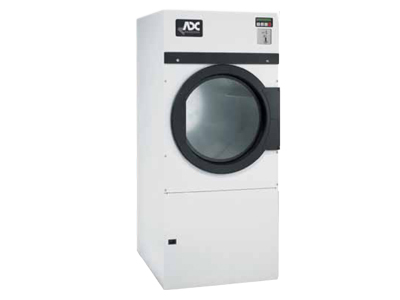 The AD-333 is a dual pocket 30-lb capacity dryer that gives you all the benefits of ADC quality engineering at a low cost. It has the efficiency of the AD-330’s axial airflow and the easy to access belt-drive system of the AD-236. The lint drawer is stainless steel and the microprocessor is our proven Phase 5, with simple controls and an easy-to-read LED. The AD-333 has a single exhaust connection as well as a singe coin drop and is available as coin or card ready. The AD-333 is available in gas heat. 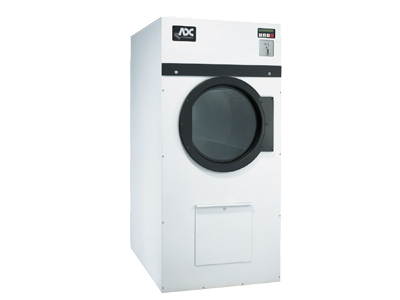 The AD-444 is a dual pocket 45-lb capacity dryer that offers all the benefits of ADC quality engineering at a low cost. It has the efficiency of the AD-330’s axial airflow and the accessible belt-drive system of the AD-236. The lint drawer is stainless steel and the microprocessor is our proven Phase 5, with simple controls and an easy-to-read LED. The AD-444 has a single exhaust connection and a single coin drop and is available as coin or card ready. The AD-444 is available in gas heat. The AD-4545 is a 45-lb dual pocket dryer featuring radial airflow and the largest door opening in the industry at 27″ in diameter. It also features the largest single coin box of any dryer with the ability to hold over 1,300 quarters. The sturdy steel lint trays with 4.25″ sides allow for maximum lint accumulation. In addition, the AD-4545 contains independent microprocessors and coin drops for each tumbler. The AD-4545 is available in gas heat. 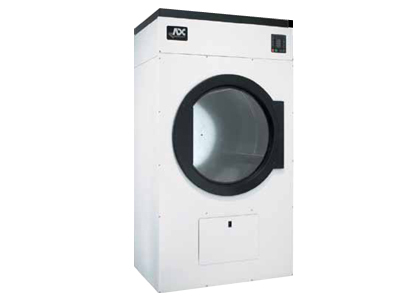 The AD-45x2R is a 45-lb dual pocket dryer featuring radial airflow and the largest door opening in the industry at 27″ in diameter. It also features the largest single coin box of any dryer with the ability to hold over 1,300 quarters. The sturdy steel lint trays with 4.25″ sides allow for maximum lint accumulation. In addition, the AD-45x2R contains independent microprocessors and coin drops for each tumbler. The AD-45x2R is available in gas heat.